Even though I am against using recipes, this post will be used as a guide or example for you to see what I would make for dinner on a random night. Since I am traveling out of the country tomorrow, and even though my husband is going to be home, we all know my vegetables will spoil. 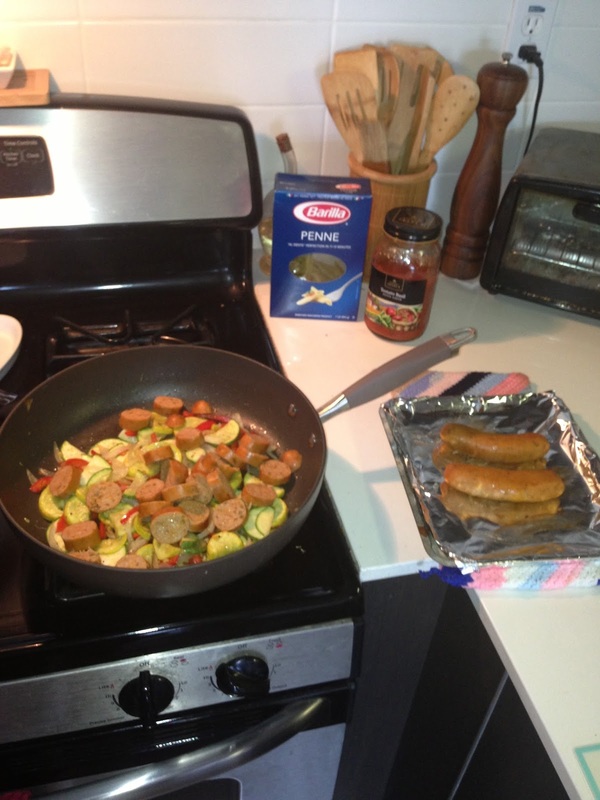 Therefore, I am going to indulge in a what I would call, a pasta primavera -- with chicken sausage. As with almost any dish I make, I begin with some olive oil in my saute pan. I like to use it liberally, as I am tossing in about 5 vegetables together and like to have the olive oil touch each veggie. I then use one clove of garlic and mince it. 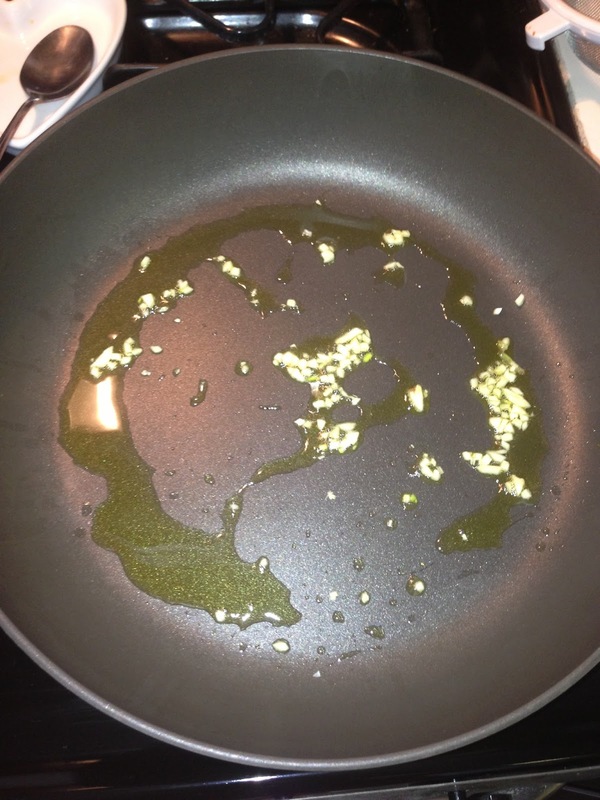 I throw it in to the already hot olive oil. Do not let this sit for longer than a minute, as the garlic burns extremely easily and will become bitter. 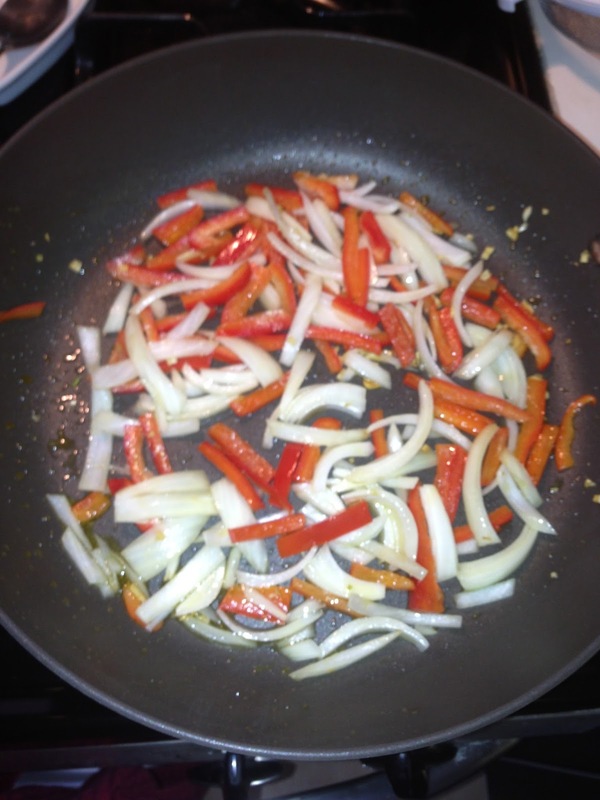 I usually always have at least one red pepper and onion on hand at my house, so since they will most likely go bad, I toss those in first. They take the longest to cook -- and plus, I LOVE the smell of them simmering in my kitchen, especially with the olive oil and garlic. Yum. 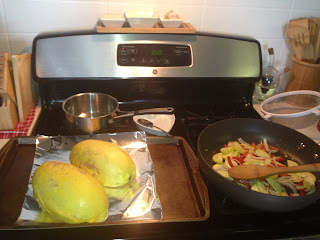 While that is simmering on low heat for a few minutes (use your best judgment), I decide to toss the spaghetti squash in the oven for about 30-40 min on 350 degrees. 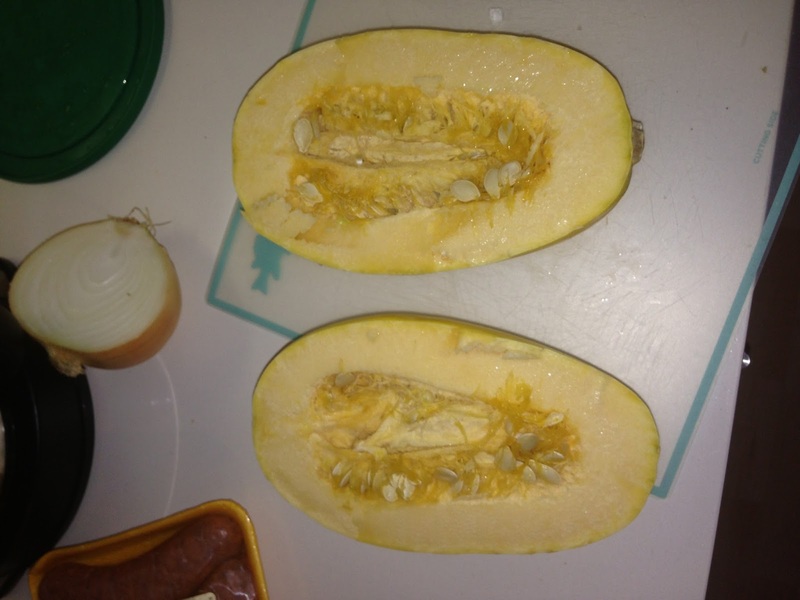 Also of note, I prefer to take the seeds and stuff out of the squash before I cook it. I find it easier at the beginning, and then the squash takes less time to cook because it's "thinner" and less dense. I have now added in the summer squash and Mexican squash to the veggies and they are all simmering on low. They don't take very long to cook, especially if you chop them into thin pieces. I also recommend using a wooden spoon as it is less likely to "tear up" your veggies making everything look sloppy and unappealing. The wooden spoon is great. A must-have in the kitchen. Now here is a current photo of my dish. I have a pot and strainer on hand, in case I decide to make some penne for Jimbo. He likes to have a little starch and protein in most of his meals. 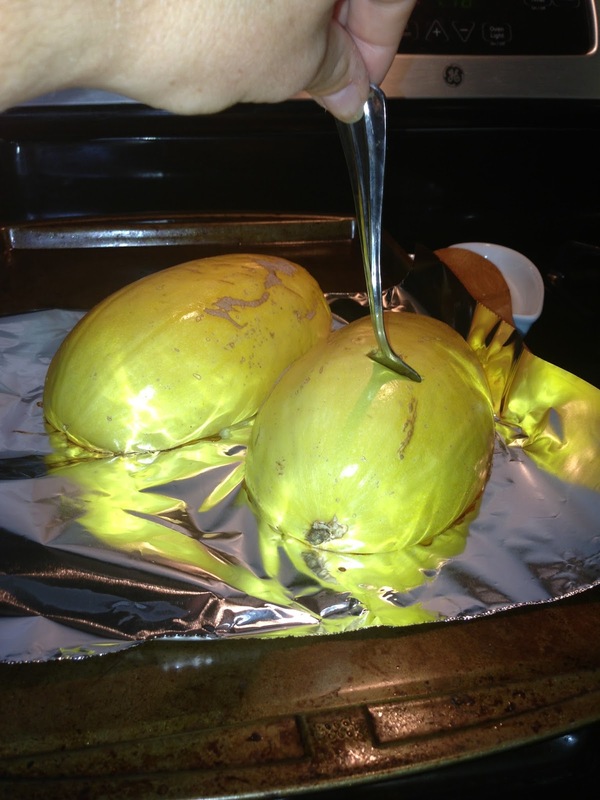 I also have the squash on aluminum foil on a cookie sheet, face down, ready for the oven which is now heated to 350 degrees. 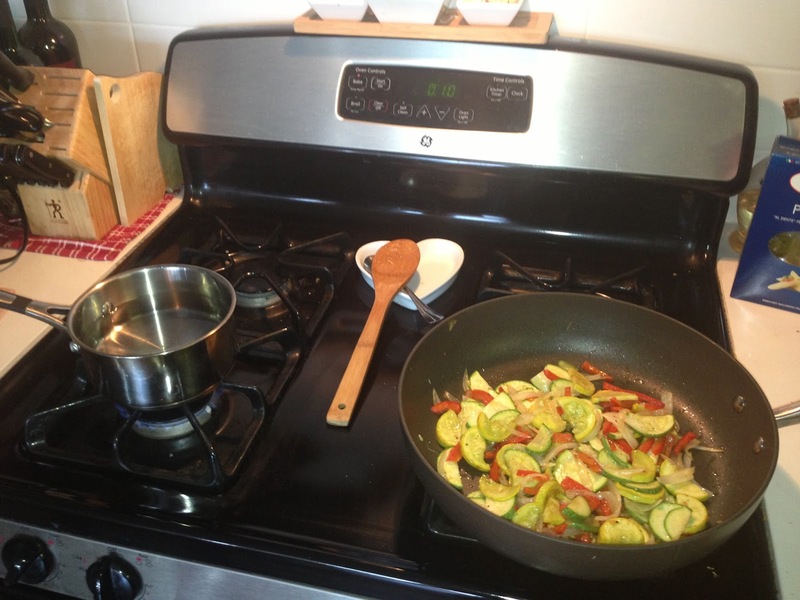 The veggies are still simmering away on my right. In order to make a dish last longer, use a starch or some sort of filler, such as pasta or rice. 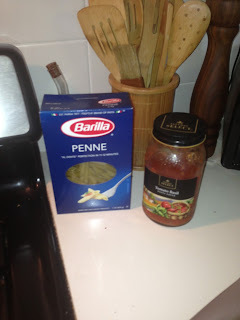 I decide I am going to cook up one cup of penne because I will be gone for about a week. Hopefully this dish will last him that long. :) I may also use this generic jar of pasta sauce since it's open, so it doesn't go bad while I am away. I would typically make my own in my crock pot, but we are improvising here. I started boiling some water for the pasta on the left side. I am only making a small amount, hence the small pot. I always toss in a pinch of sea salt to get the water rumbling. 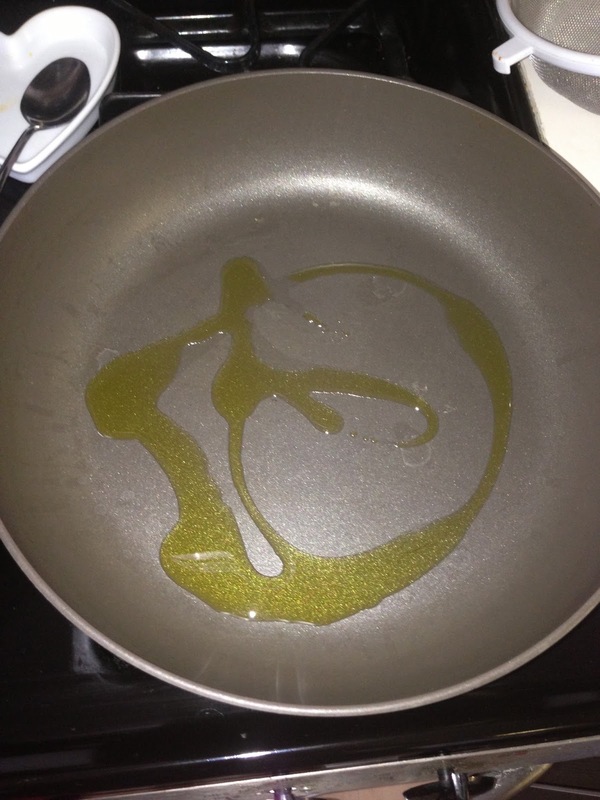 I don't use olive oil. I think it's a waste to be honest. 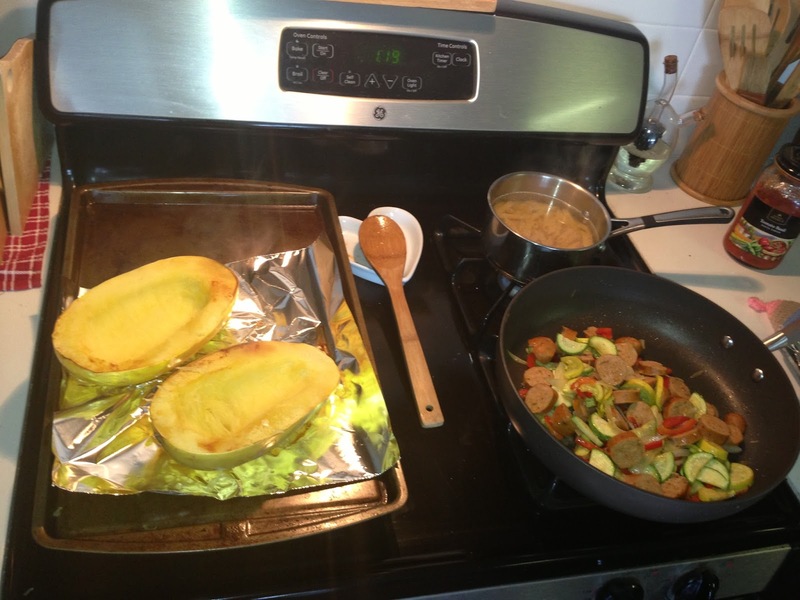 Also of note, there is 10 minutes left on the spaghetti squash in the oven and also the veggies -- they are about done! Sausages are now done. 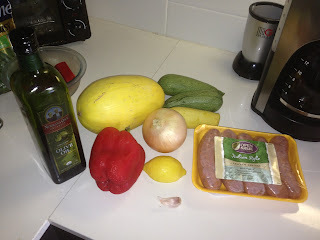 I plan on using only three of the chicken sausages in this dish, and that way if Jim wants to have a sausage on a bun sometime later this weekend, he can do that. Three sausages are now added to the veggies, and the other two are on standby. When the pot starts boiling, I will toss the pasta in for about 10 minutes. I flipped the squash over to cool, I added the penne to the boiling water and the veggies are still simmering in the saute pan on very low heat. The pasta will cook for about 10 minutes. 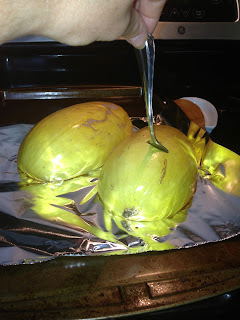 When the squash cools, I recommend using a fork to get out all the yummy goodness. 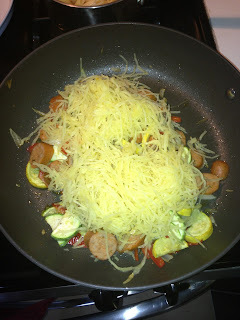 Pour the squash into a separate bowl and then add the desired amount of spaghetti squash to your veggies/sausages. Of, if you prefer (I feel like my sister would like this) -- keep all things separate in the fridge. 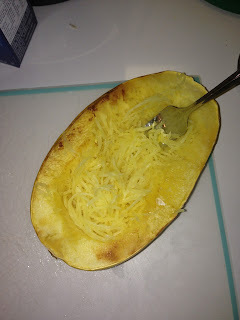 For example, store the veggies in one container, the meat too if you opted for that route, the spaghetti squash in another container and then the pasta in another. 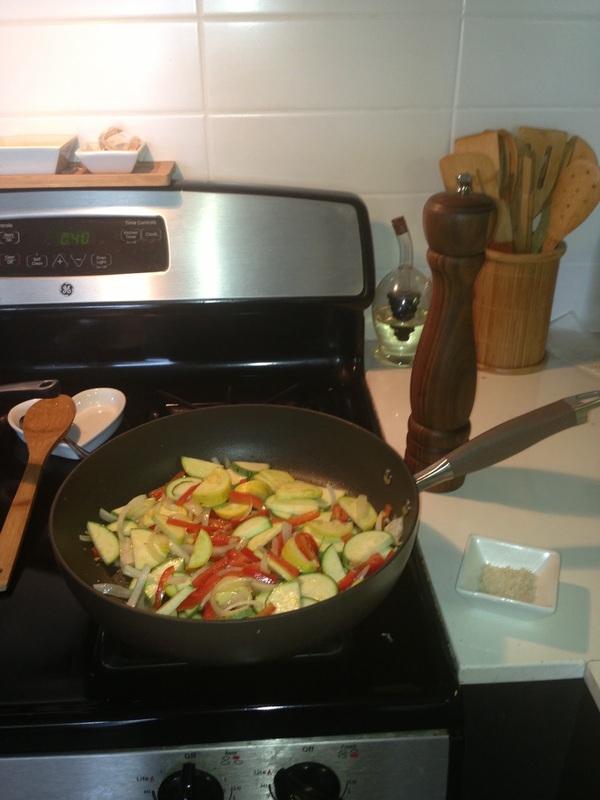 That way, you can add the desired amount of each as you make your meals during the week. Examples: If you are feeling vegetarian then don't add the sausage slices, if you are rockin the low-carb then opt for no pasta, don't add cheese if you are lactose intolerant, etc. Your options are really endless and it can switch up the consistency of each meal so you don't get bored. At this point, I recommend using a fork to scrape out all that yummy squash. It should be real simple if cooked properly. 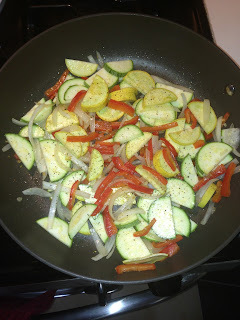 Then either throw it all in a bowl or add it straight to your veggies/sausages. Your call. 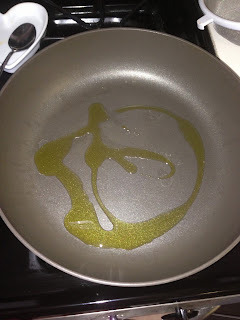 You can now add a sauce of your choice, such as marinara, or a bit of lemon juice to make it taste super fresh or even drizzle some EVOO on top and it's delicious. If you want to add goat cheese, or parmasean cheese, either one would be great. Whatever you do, have fun with it! 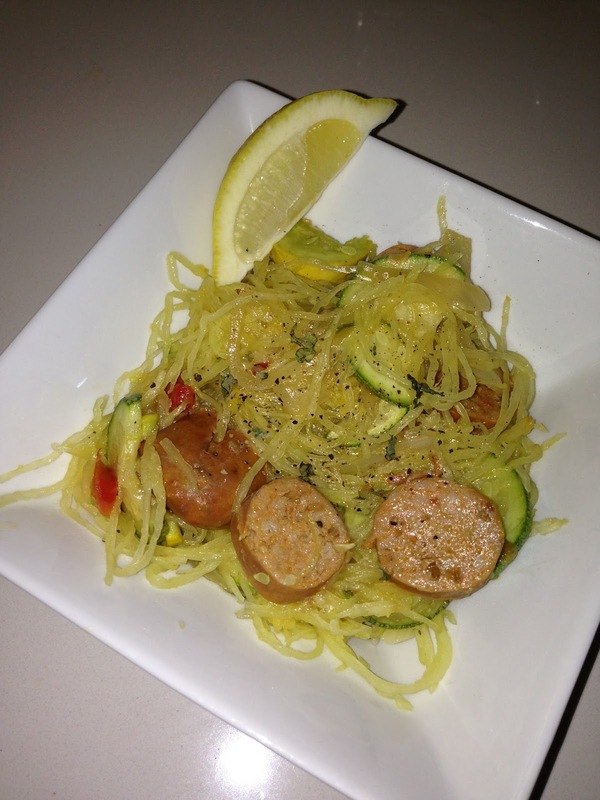 Here is my finished product, I opted for the lemon. Doesn't it look like pasta and veggies?! Crazy it's all low-carb, gluten free, and dairy free (if you opt for no cheese). Enjoy!